SORRY, WE DO NOT DO WEEKEND OR MIDWEEK BREAKS. WE ONLY ACCEPT WEEKLY BOOKINGS (SATURDAY TO SATURDAY). 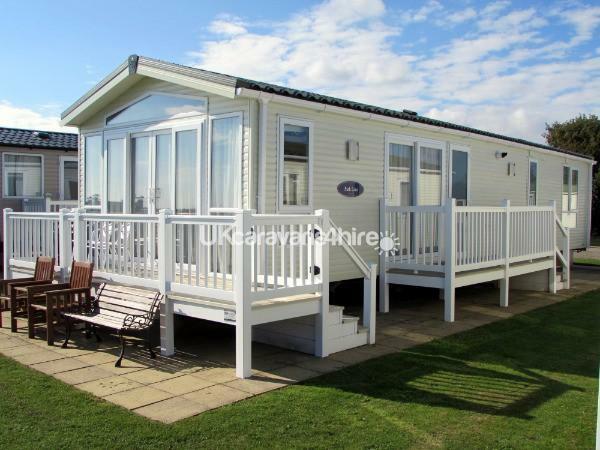 This is a Luxury Pemberton top of the range caravan situated on a Haven site and is rated as PLATINUM , it is a 3 bedroom, 6-berth, 42ft x 14ft caravan situated at the seafront in a quiet cul-de-sac with a hedge separating it from the beach. There is an access to the sandy beach about 75-100 yards from the caravan. 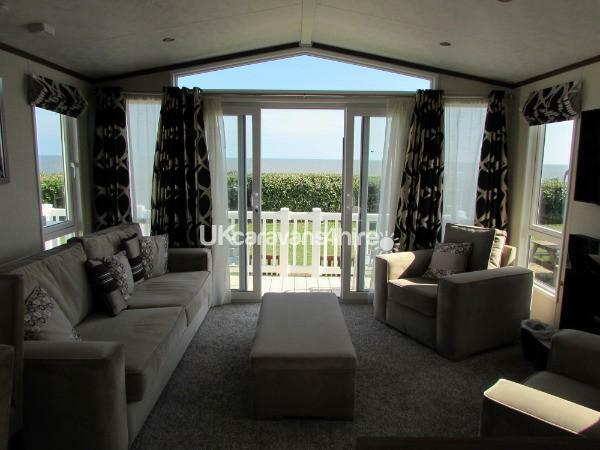 It is situated at one of the quietest spots on Hopton Holiday Village and is far enough away from the clubhouse so you will not get all the late-night noises, but it is only a few minutes walk away from all the amenities and therefore makes it an ideal position for peace and quiet. 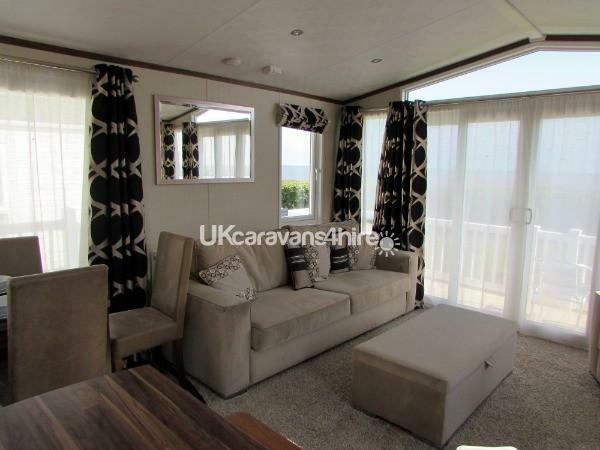 The caravan has double-glazed windows throughout and central heating, 2 sliding patio doors, one of which open out to a panoramic view of the sea. It also steps out onto a lockable gated verandah down onto a patio and about 20ft of grassed area which is unobstructed by passing vehicles. The other sliding door is in the dining area which lead out to a small verandah. Lounge: a large, comfortable and spacious lounge with a three piece suite and scatter cushions, 48-inch flat-screen Freeview TV, Blu-Ray player and soundbar, remote controlled modern coal-flame effect electric fire, and double sliding patio doors which lead out to the verandah with table and four chairs and looking out to the sea. The soundbar is Bluetooth enabled which means that you can play your music through it from any Bluetooth enabled devices such as iPads and laptops. 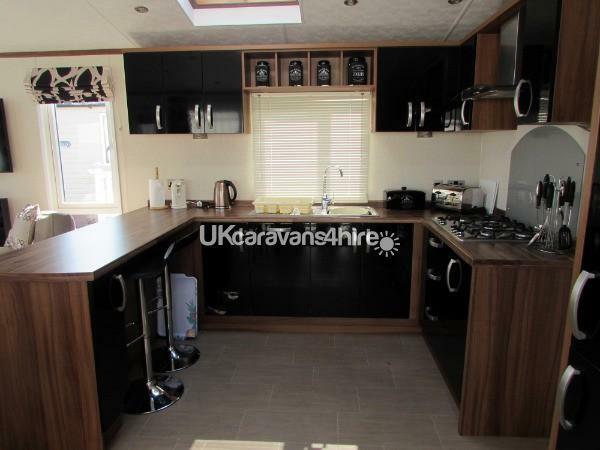 Kitchen: is equipped with an integrated microwave, four-slot toaster, electric tin opener, electric kettle, coffee machine, full size fridge/freezer, dishwasher, built in cooker with separate grill and oven with 5 burner hob & extractor hood. 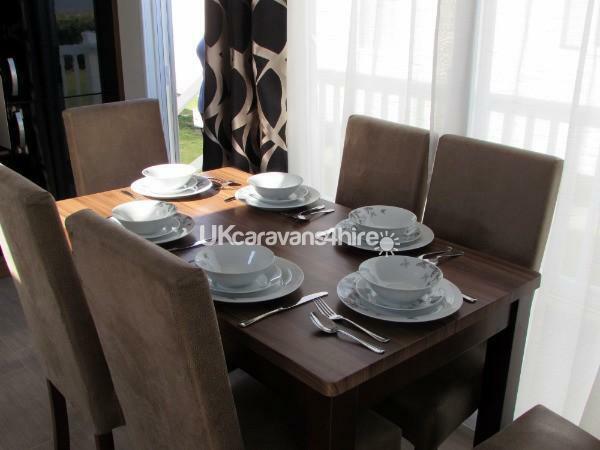 Dining Area: has a table and six upholstered chairs. 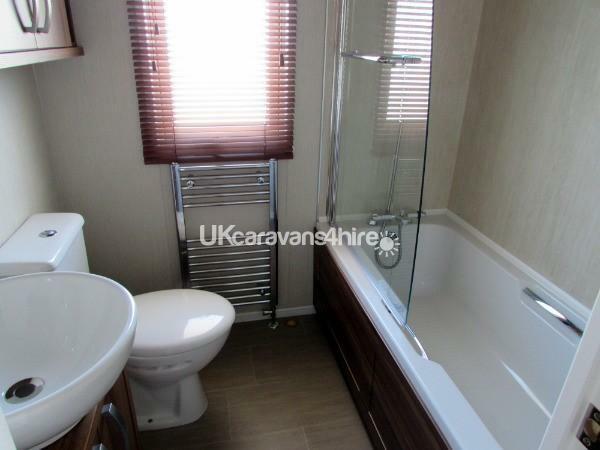 Bathroom: has a full size bath plus handheld shower, toilet, modern basin with mirror, wall cupboard and a heated towel rail. 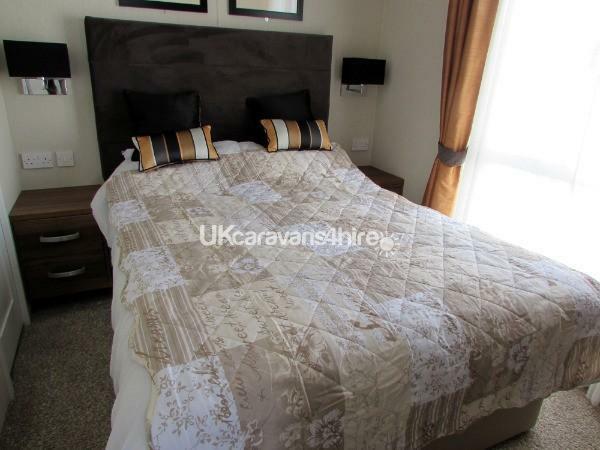 Master Bedroom: has a double bed, bedside drawers on each side, 2 full length wardrobes, dressing table unit with electric shaver point, hairdryer and 20" flat-screen Freeview TV. It also has an en-suite toilet with shower, basin and wall cupboard. Second and Third Bedrooms: both have two single beds, wardrobe, wall cupboards, bedside shelves between the beds and 20" flat screen Freeview TV. Utility Room/Cloakroom: has a washer/dryer machine, linen basket, iron and ironing board, vacuum cleaner, mop, dustpan and brush, shelves, cupboard and coat-hangers. 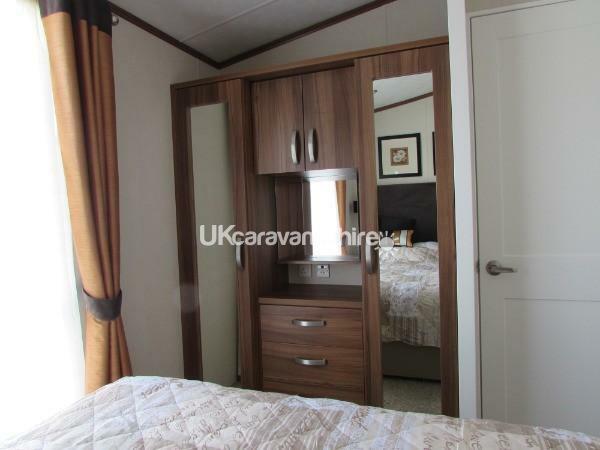 The caravan runs on piped gas, thus eliminating the need for gas bottle changing and has a gas Combi central heating system with thermostatic radiator valves and also has a carbon monoxide and smoke detectors fitted. Pillows and duvets are supplied (1 double and 4 single duvets and 12 pillows) but please take your own pillow cases, duvet covers, bed sheets, towels, face flannels, tea towels and toiletries as they are not supplied. Bed linen can be hired from the reception at the Park if preferred. Gas, electricity, water and heating are included in the price. 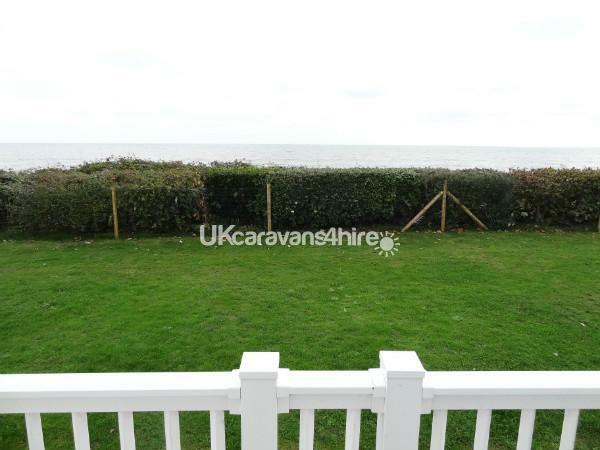 There is a car parking area directly outside the caravan. A non-refundable deposit of £80 per week is required to secure your booking and the balance 42 days prior to the start of your holiday. IMPORTANT NOTICE:- PLEASE BE AWARE THAT THE HOLIDAY HOME IS INSURED FOR UP TO SIX PEOPLE ONLY AND THE INSURANCE WILL ONLY COVER FOR THE OCCUPANTS NAMED ON THE ORIGINAL BOOKING FORM. FUNWORKS PASSES FOR HOPTON HOLIDAY VILLAGE ARE NOT INCLUDED IN THE PRICE. PASSES CAN BE PURCHASED AT THE RECEPTION ON ARRIVAL. PLEASE NOTE:- WE ONLY ACCEPT WEEKLY BOOKINGS (SATURDAY TO SATURDAY). SORRY, WE DO NOT DO WEEKEND OR MIDWEEK BREAKS. Absolutely gobsmacked when entered the caravan. What a luxury van with a fantastic view! Having been to this caravan now, we wouldn't go without all the facilities and the view this caravan had. 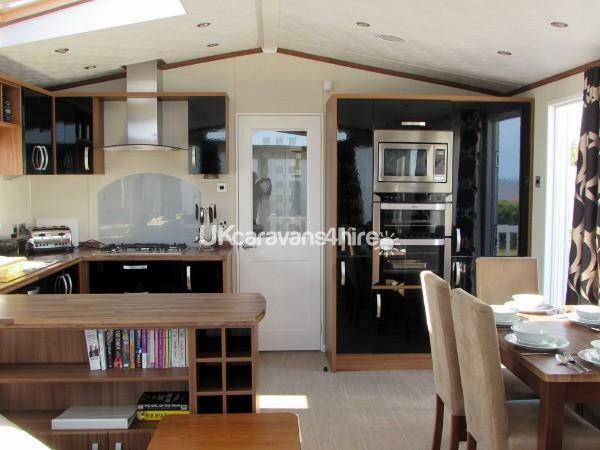 Thank you Mr and Mrs Pritchard for letting us hire your lovely caravan. 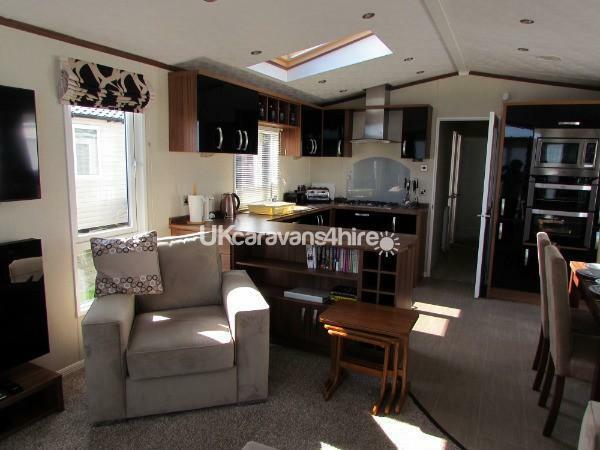 This is a wonderful caravan in an enviable position, the beach and coast path are a minute away, the swimming pool is also not too far away. 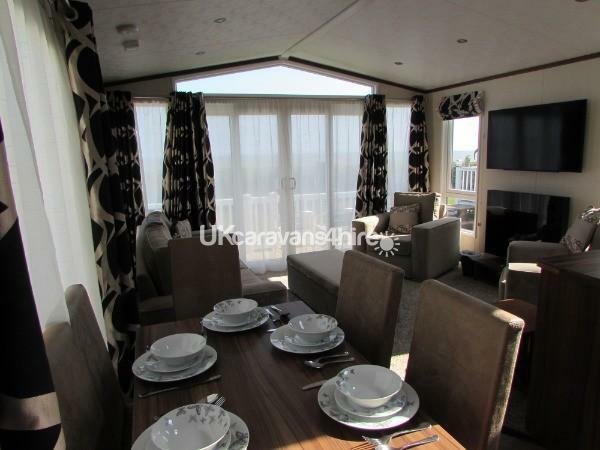 The caravan has brilliant facilities, an uninterrupted view out to sea and of Gt Yarmouth (which is great lit up at night) and is presented to a very high standard, the owners are also easy to liase with. We had a great week and hope to return at some point. Some of the cupboards and freezer space are not usable to guests. On the first glimpse of the caravan we were so pleased at the location of it and the sea view from the verandah.When we entered we were amazed at the size of the caravan and the beautiful furnishings and facilities that were available to make our stay perfect.So much attention to detail had been put in to really ensure everything you needed was there to make our stay as enjoyable and comfortable as possible.Access to the beach was close by and led you to perfect sand and man made rock coves where children could play as our 7 year old grandson soon discovered.Added to all this it was a total pleasure to deal with the owners Shirley and Geoff who always made you feel comfortable when dealing with any questions that we had.Thank you for our perfect holiday and already looking forward to next year.Ken Sandra Matt Karen and little Alfie.